July 31, 2015 by midgeguerrera, posted in Food - Eating In and Out! Be still my heart! Could this be true? In this city of high-rise hotels that serve three mediocre meals a day we actually found incredible Chinese food and yes yummy yummy sushi. Sushi Ruyi was a beacon on a dark and stormy night. OK, it was a clear and hot night but you get my drift. Our hotel, as all the hotels here, offers a fixed price three meals a day plan. Jack and I prefer to eat in local, family-owned restaurants and forgo the typical tourist fare. 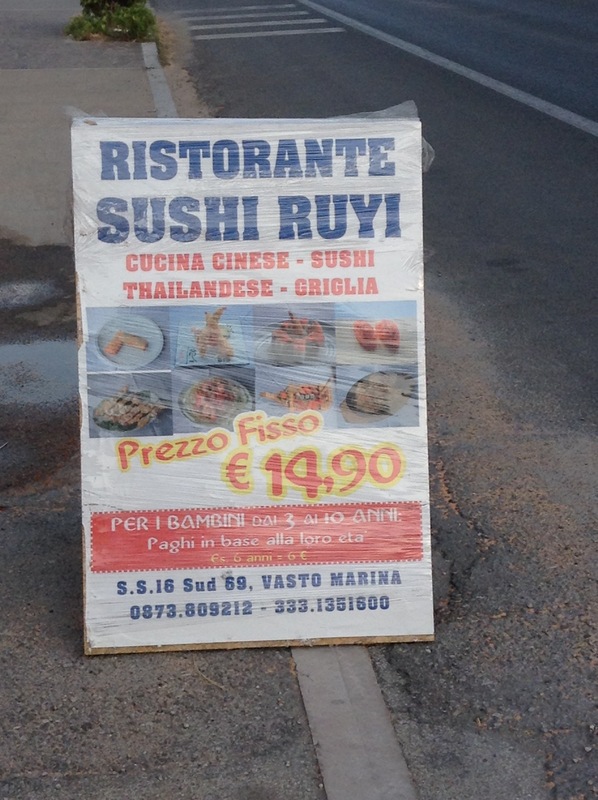 What we didn’t know was that there were hardly any restaurants in Marina di Vasto. At least none we could walk to. We hopped in the car and started driving. Restaurant sign after sign affixed to hotels. Then we spotted our favorite word “sushi”. We parked and ran before the mirage disappeared. Night one – yes there was a night two- we opted for only sushi. 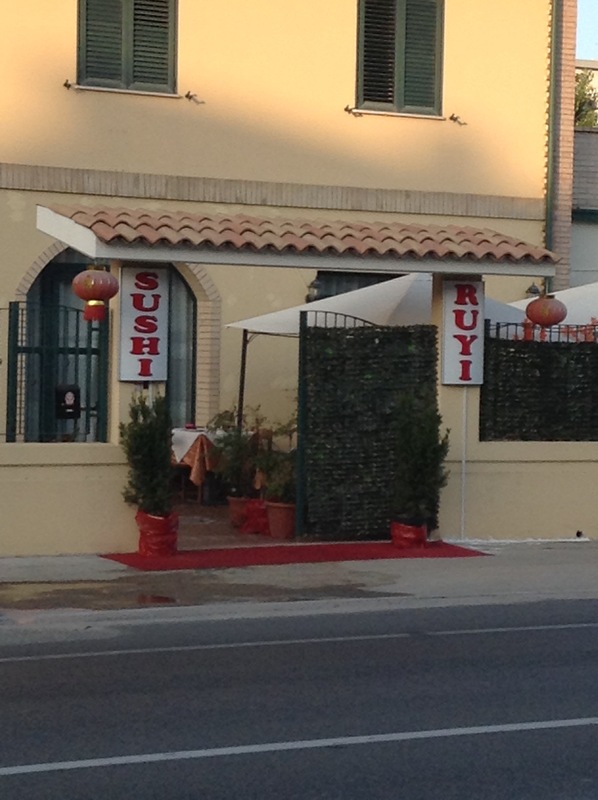 The restaurant offers Japanese, Chinese and Thai fares. The fish was fresh and the prices fair. We had tuna, salmon and a giant roll. I didn’t take any photos. – we gobbled too quickly. Then we tried something new – sushi barca. Two pieces for €6. Steep Price for sushi until we saw the size. No way you could put this in your mouth with one gentle gulp. The amount of rice was very large and an incredible amount of salmon was sculpted around it in the shape of a boat. Complete with little mast. It was worth the price and we ate it slowly savoring every bit of the salmon. Of course we sushi gluttons also ordered sushi barca di tonno. With sake and wine the cost was €55. Jack said ” this is better than any of the Chinese food within 50 miles of Flagtown.” We started with fried wontons. They were deep fried crispy and I chastised Jack for ordering them. They weren’t special except for the piece of pork in the center. Jack liked them drizzled with hot oil. I had ordered ravioli vaporato- steamed dumplings. We didn’t get any dipping sauce and these did not need anything. They were filled with delicately seasoned pork. In the name of science, we both ordered soups. Jack – hot and spicy. Me – corn and chicken. Both broths were obviously homemade – no salty canned chicken stock here. Scrumptious. The Mai Fun – Spaghetti di riso curry con vedure was perfect. No stuck together glob of rice noodles- it was fragrant and airy. I could go on and on but it is making me hungry. Just suffice it to know that if you are in southern Italy and jonesing for sushi or Chinese food you should head to Marino di Vasto. Previous postGenealogy Hint 1 – Start with your Family! No sugar added. The rice wine vinegar made the rice sing. I love the idea of fish sculpted into a boat floating on a sea of sushi rice. YUM! What sushi chef worth his knife puts sugar in sushi rice? The ones who work for the franchise I wrote about last year. Yummmmm……Where exactly is Marina di Vasto? In Abruzzo, Italy – on the Adriatic coast.